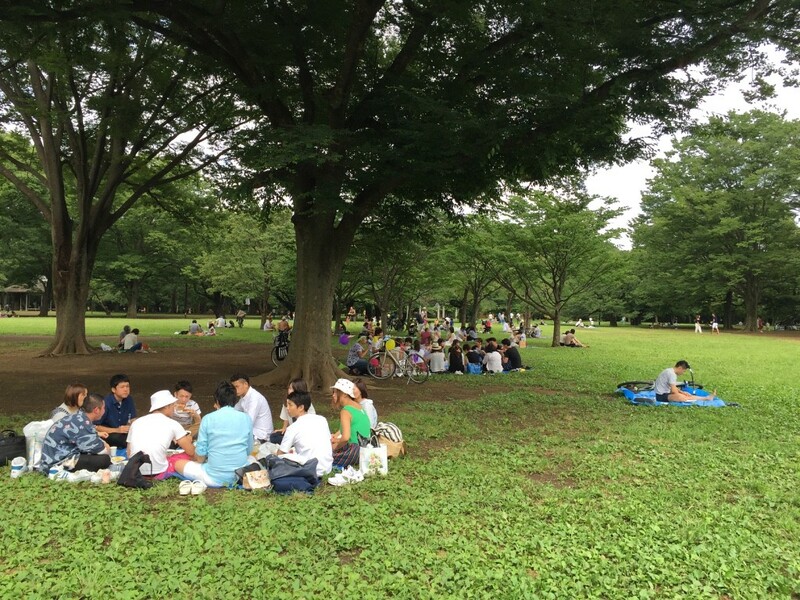 Yoyogi-koen Park is one of the liveliest parks in the city and in a prime location between Harajuku and Shibuya. 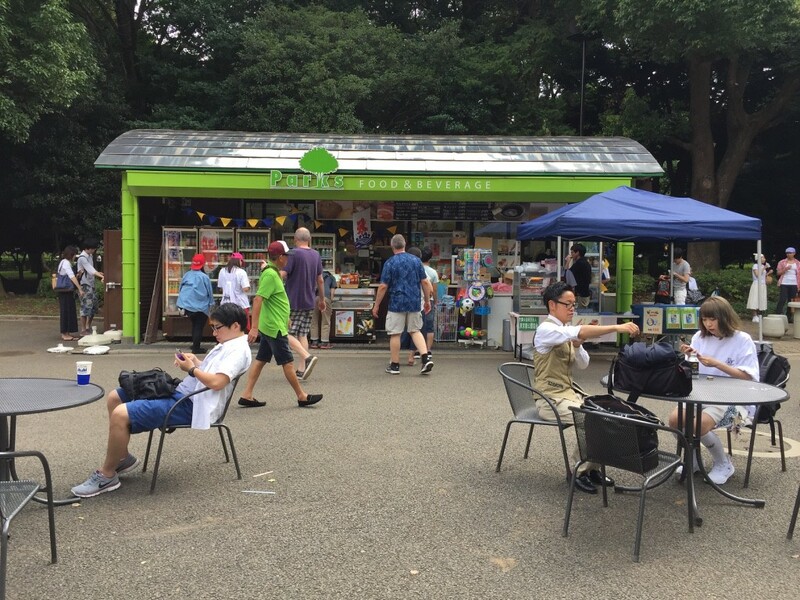 Factor in Meiji-jingu Shrine next door, cultural festivals and events almost every weekend, and a cosmopolitan busker community, and consider the planning phase for this day on your itinerary complete. For families with kids, there is no better place to spend the day, as Mario Leto explains below. 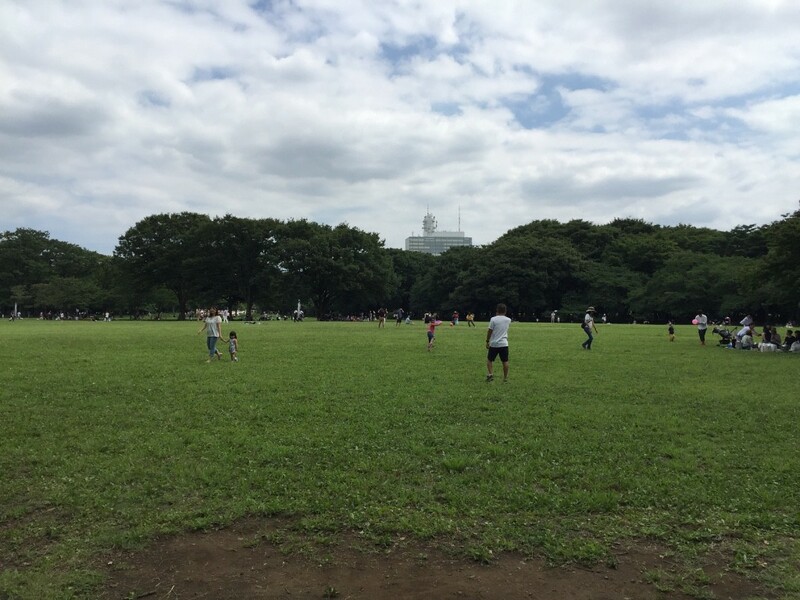 Yoyogi-koen has always been an open space for activities requiring open space: launching powered aircraft (1910), military marching (~1945), housing American Allied officers (1945~), playing Olympic sport and housing athletes (1964), etc. You know, all of those standard weekend activities. Today, the park is better known for its wide-open green space and weekend festivals celebrating an eclectic assortment of nationalities, cultures, and culinary traditions. 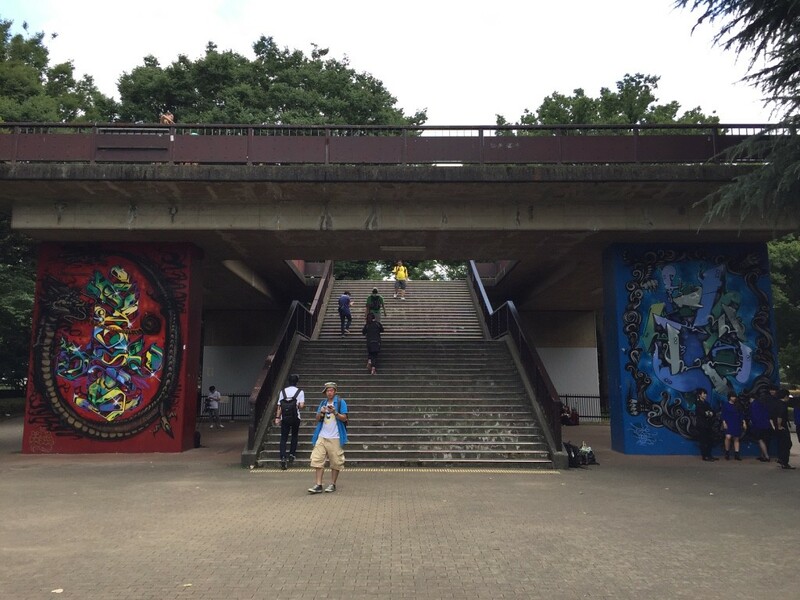 Because of its central location, Yoyogi-koen can be accessed from several different directions and train lines. 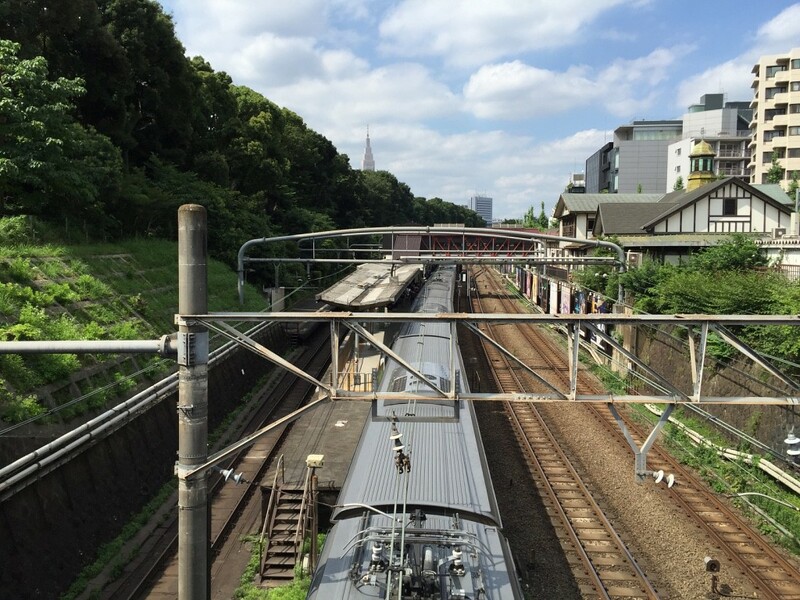 The closest and most common access point is Harajuku Station on the Yamanote line (4 minutes, ￥140 from Shinjuku), but other options include Meiji-Jingumae Station or Yoyogikoen Station on the Chiyoda subway line (11 minutes, ￥170 from Hibiya to the former or 14 minutes, ￥200 to the latter), Yoyogi-Hachiman Station on the Odakyu line (5 minutes, ￥130 from Shimokitazawa), and Shibuya Station, also on the Yamanote line (12 minutes, ￥170 from Shinagawa). Shibuya Station and Harajuku Station are next to each other on the Yamanote line and offer access to opposite sides of the park. For my own journey, I used Harajuku Station on the Yamanote line. It's a small, crowded station and is probably best avoided on weekends and holidays, especially at peak travel times (mid-morning and early evening), but its convenience sometimes clouds judgment. I have often engaged in mental self-flagellation while packed into the slow-moving crowds trying to maneuver the station environs. If you find yourself in a similar situation, head for the Omote-Sando Exit (up the stairs, not down), walk straight out the gate and up onto the bridge where you will turn right and follow the crowds. 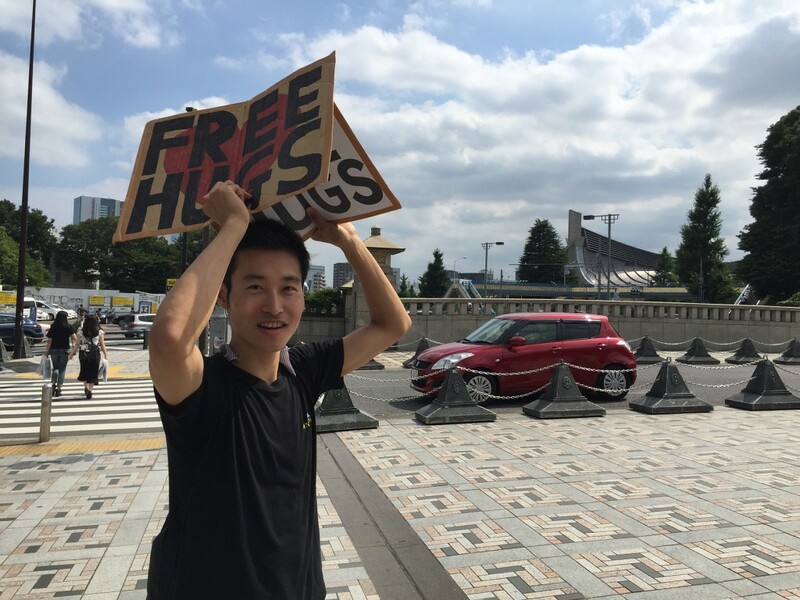 Don't forget to give Daichi a hug on the way. It's free. 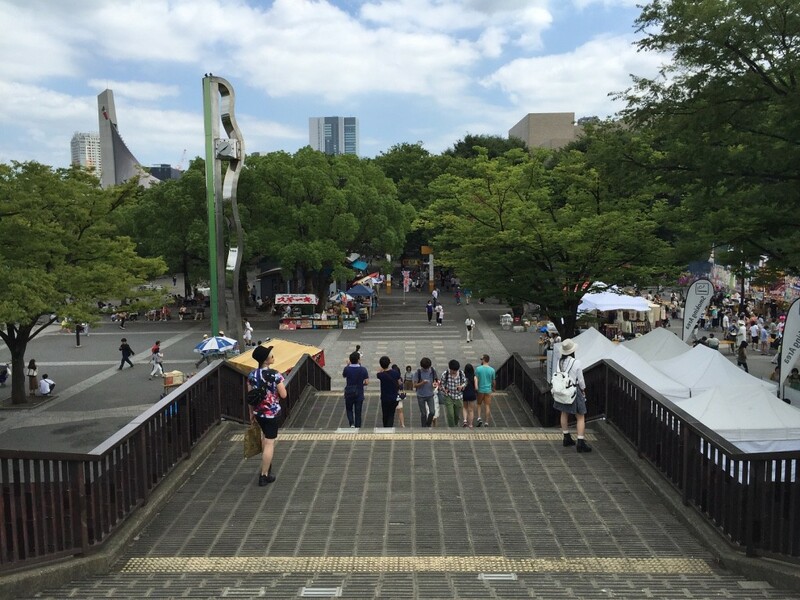 Once up and over the bridge, you should see Meiji-jingu on your right. I recommend a day trip that combines the park with the shrine due to their proximity. The only choice to make, then, is which to visit first. Is there a festival on at the park? Will you be drinking alcohol? Do you want to exit the park on the Shibuya side? If you answer yes to these questions, then I recommend the shrine first. In a sense, start your day slowly and spiritually and then gradually allow yourself to descend into a maelstrom of debauchery. Surely a motto for the age. 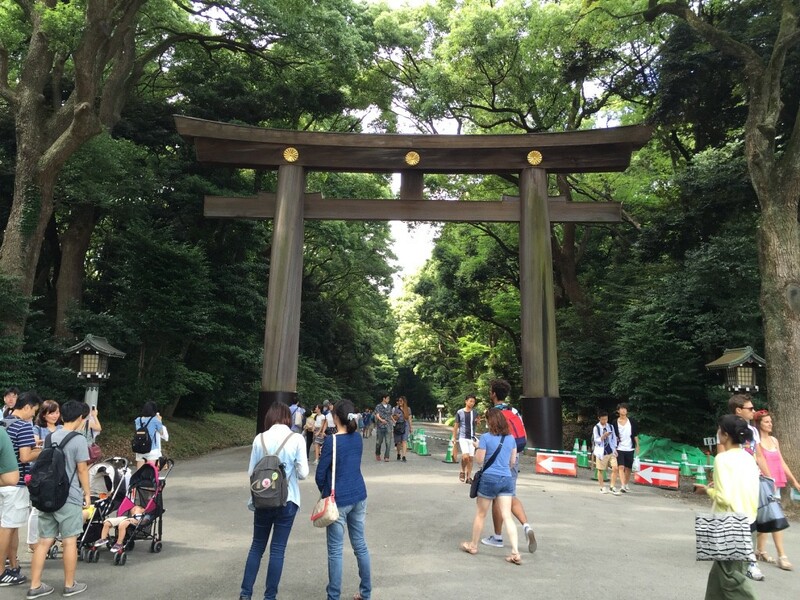 Meiji-jingu was established in 1920 in honor of the late Emperor Meiji, who passed away in 1912. The original main shrine building was destroyed by Allied bombings during the war and the current building was erected in 1958. The shrine grounds are separated into two sections, the inner and the outer gardens, and cover a total of around 97 hectares of land, which is about one square kilometer. For tourist purposes, the inner gardens, which house the shrine building complex, are of singular concern. Visiting the shrine should take around one to two hours depending on how fast you walk, how many times you stop, and how long you linger at places like the shrine building complex and the bunkakan, which houses a restaurant, a souvenir shop, a museum, and a food court. 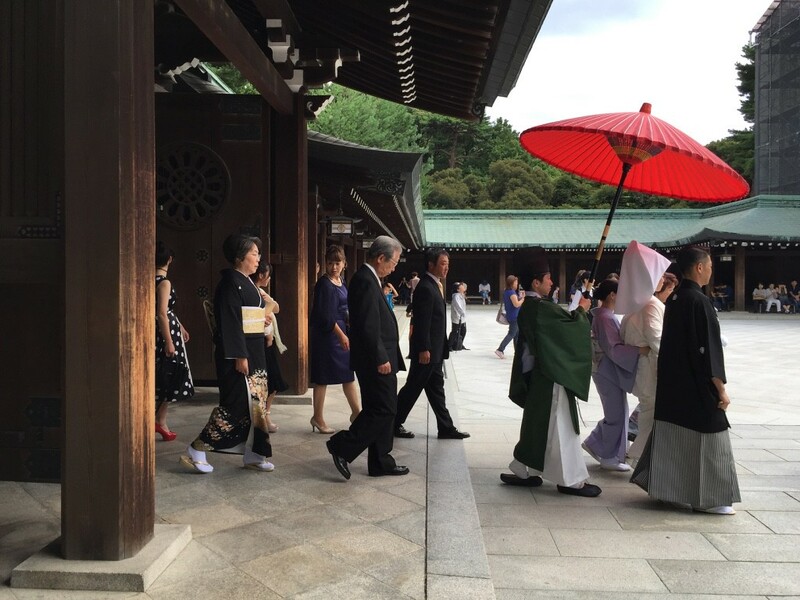 The shrine grounds have hours that vary according to the time of year, but you can generally expect them to open early, around 5:00 or 6:00, and to close comparatively early, around 16:00 to 17:00. Check the link above for hours, history, maps, shrine etiquette, and other interesting tidbits. Leaving Meiji-jingu through the same place I entered, I followed the crowds out and right along the main road for a block or so until the Yoyogi-koen entrance where I was greeted by the Tokyo Rockabilly Club. 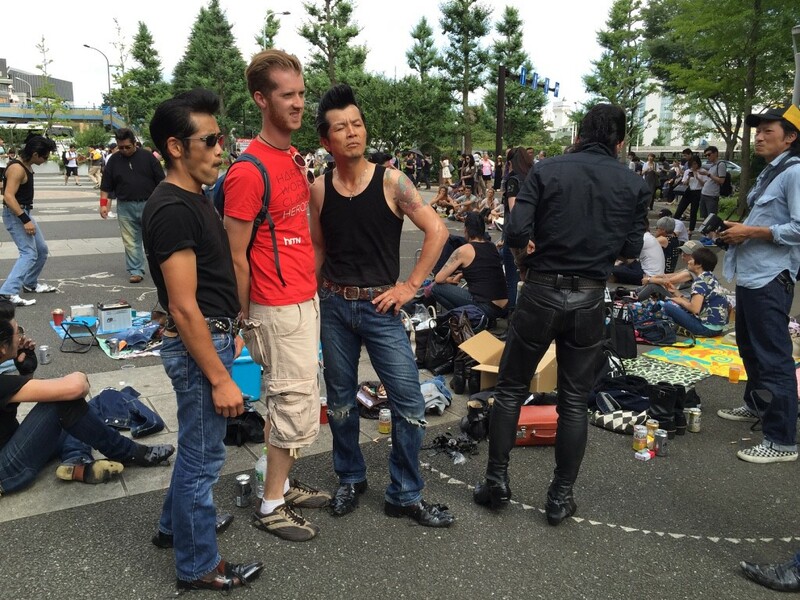 The Tokyo Rockabilly Club. Sorry, but I had to write that twice to convince myself of its existence. The club members dress, dance, and generally exude 1950s American (Hollywood) rockabilly culture. They have been around for decades and are certainly a Sunday afternoon highlight for park denizens. Rockabilly—the love tryst of rock-n-roll and country music—apparently entered Japan in 1955 with the release of Bill Haley's "Rock Around the Clock", but experts generally believe that the current rockabilly dance and fashion trend arrived in the 1970s with movies like American Graffiti and television shows like Happy Days. 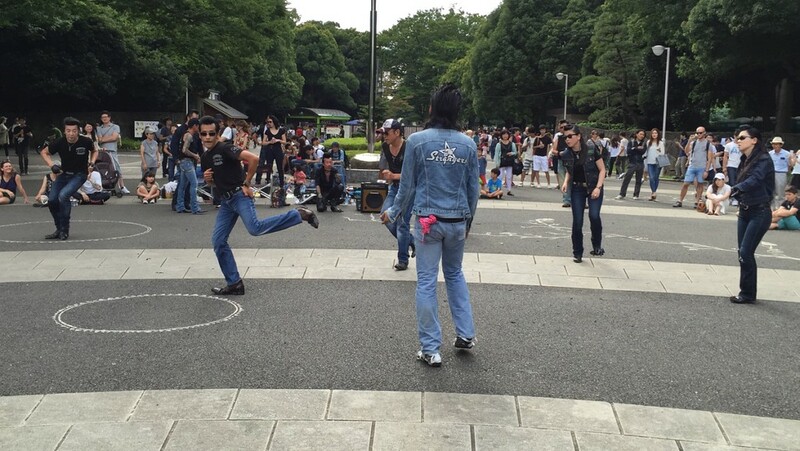 The members of the Rockabilly Club in Yoyogi-koen are undoubtedly entertainers and the gawking crowds are always large and entertained, whether they claim to be true rockabilly aficionados, sadomasochists, or unbelievers constantly in need of sensory affirmation. 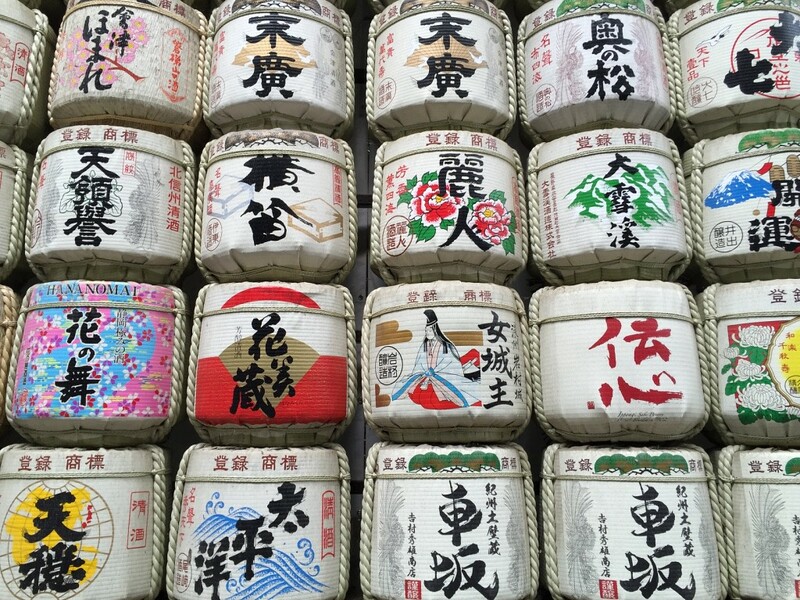 I claim to be one of the latter and so find it a nice complement to Meiji-jingu. The park is split into two parts, which I'll refer to as the park side and the festival side. The difference between them, as you may have guessed, is that the park side is all grass and trees and the festival side is all concrete. The park side is where you'll enter if you arrive at Harajuku Station or Meiji-jingumae Station, and the main entrance is where I encountered the rockabilly dancers. If you can pull yourself away, continue on into the park, perhaps stopping at the first of several refreshment shacks on your left just inside the entrance to grab a frozen treat, a soft drink, a beer, or some outdoor sporting equipment. There is a large concrete park path that guides you through the park side, but the park is not complicated to the point of needing to stay on the concrete course. Going off path is acceptable and encouraged, especially into the inner field where all manner of sport and folly take place. The park is, quite simply, a large grassy field and pond encircled by forest and paths. Once you reach the fountains that run off perpendicular on your right, feel free to either keep walking around the outer edge of the park along the path you are on, or turn right along the fountains and head straight for the center field. Afternoons and evenings see the largest number of buskers in this area of the park, the benches along the fountains the perfect place to set up shop. Unfortunately, in the photo above, the Pokemon Go community has taken over the fountain range. If you keep walking along the circling park path, you will eventually run into the bicycle rental shop. Yes, there is a bicycle rental shop, and it's located in the north-west part of the park. 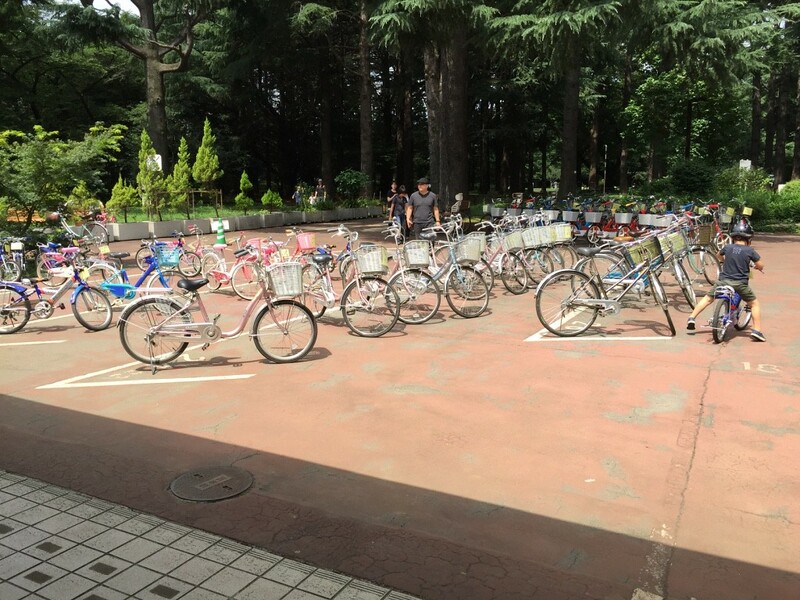 Office hours are 9:00 to 16:00, Tuesday through Sunday, and rentals are about ￥210 per hour for kids, adults, and tandems, ￥100 per hour for bicycles with training wheels. Imagining that two adults and two kids could ride in circles for three hours straight, the cost would only run around 20USD. Not bad for an entertainment that both pleases adults and exhausts children at the same time. Leaving the bicycle rental shop, you can either continue circumnavigating the park on the walking path, or you can shoot straight toward the center field and check out the day's activities. 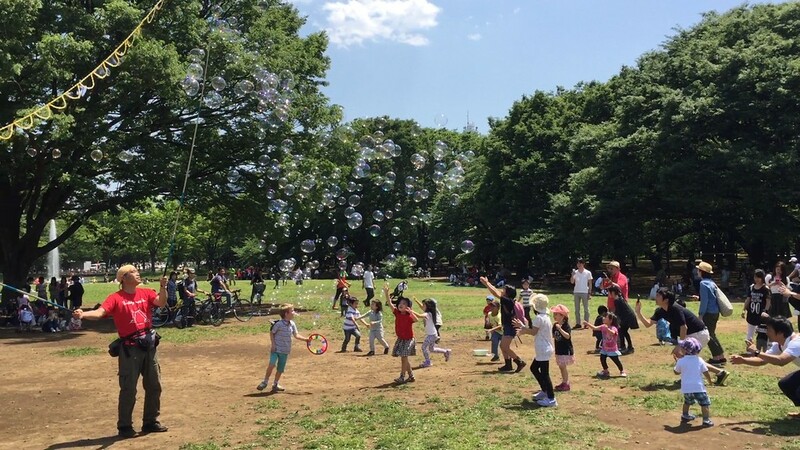 I chose the latter route, which took me past the fenced-in dog park and left me staring into a great expanse of green grass where a man with a homemade bubble dispenser delighted people of all ages with a swarm of bubbles from his dripping bubble chain. Yes, that last sentence is my own original, and no, I'm not sure that I like the sound of it either. But the bubble man wasn't the only entertainment to be had in the great expanse. People were having picnics and drinking parties, playing frisbee and football, and engaging in all manner of generally embarrassing activity. In fact, the whole of Yoyogi-koen is a creative rice cooker where the amateur comes to learn and the dreamers come to discover. I've been to the park too many times to count, but on this particular day I saw DJs, dance troupes, martial artists, actors, gamers, jugglers, musicians, and any number of indescribable weirdness. Except mimes. No mimes. Thankfully. After spending a good deal of time wandering the park side, I headed south toward the festival side to see what was going on. I chose to cross the main road that separates the two sides of the park by using the overhead walkway, but one can just as easily wait for the light roadside, which means no stairs and no problem for people with physical disabilities. The festival side of the park is host to any number of festivals and events throughout the year, the most notable of which is the Thai festival which now occurs several times annually under a variety of themes but always essentially the same: Thai food, Thai music, Thai culture. 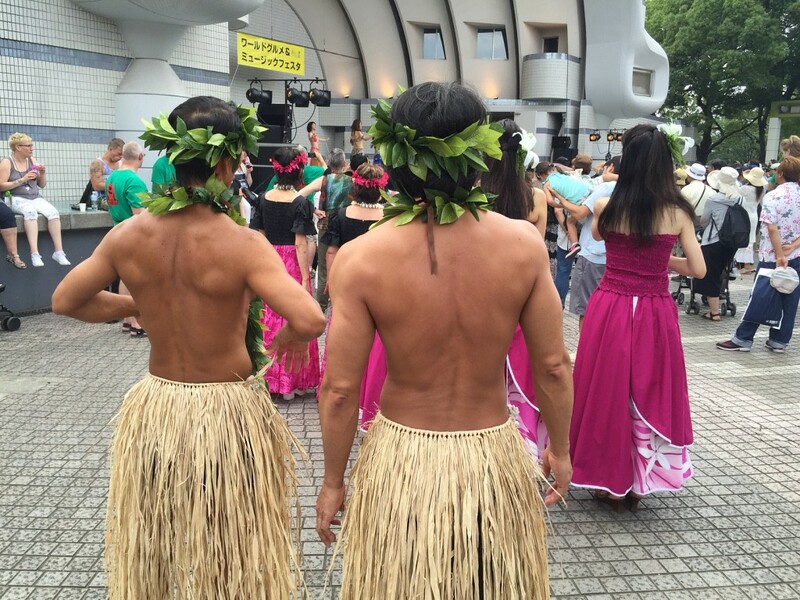 If you don't like crowds, don't go, because Tokyo has people and people like their summer festivals. You will fight for food and fight for space to eat it, but it's my highest recommendation on the festival schedule. Check the link above for dates early in the year (all in Japanese but translation websites are free online). On the Sunday in July that I went to the festival side of the park, there was a small music festival and earth-day market. In typical fashion, that meant a variety of original food stalls and souvenir stands in addition to the usual Japanese festival fare available year round at festivals throughout the country. Most standard festival fare is fried, deep fried, or somehow slathered in oil and sweet gooey goodness, and for that reason is always popular with youth and the young at (not so healthy) heart. On my own particular journey through the park, I did not stop to eat a proper lunch but instead snacked throughout the day. Food stalls are abundant, and, as mentioned above, individual festivals offer more options than the standard Japanese fare. 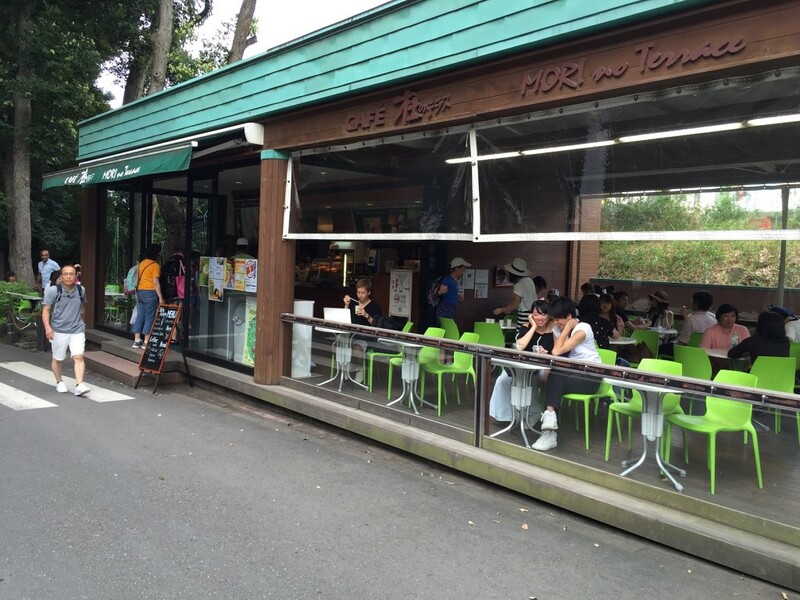 There are of course options for sit-down meals on the grounds of Meiji-jingu at the bunkakan or the cafe at the entrance to the shrine, Mori no Terrace (pictured above); at restaurants in either Harajuku or Shibuya; or, for the more adventurous, restaurants around Yoyogi Hachiman Station out the backside of the park. It's Tokyo, and one will never be in want of a place to eat a proper meal. 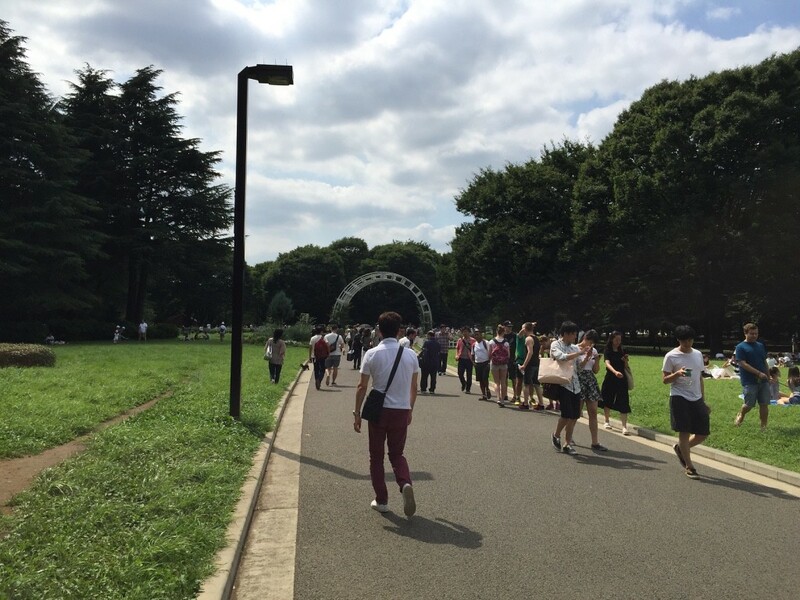 The festival side of the park is not only a concrete space for festivals but also contains the Yoyogi National Gymnasium (1st Gymnasium) and its smaller identical twin, the 2nd Gymnasium. The 1st Gymnasium hosted swimming and diving events at the 1964 Olympics, the 2nd Gymnasium basketball, and both can be expected to play a role in the upcoming 2020 Olympics. 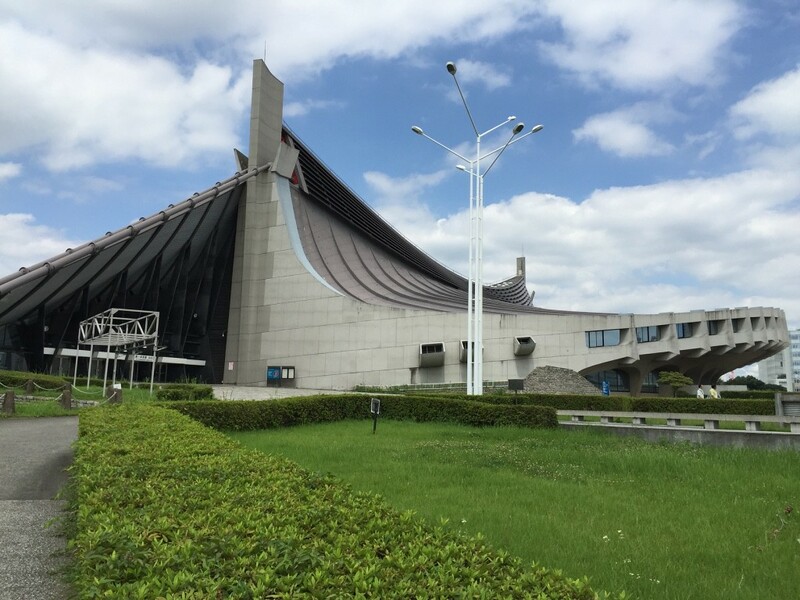 The gyms were designed by the award-winning architect Kenzo Tange, who also designed the Hiroshima Peace Memorial Park and the Supreme Court of Pakistan Building, among others. Check out this short visual documentary on the gyms by Vincent Hecht. 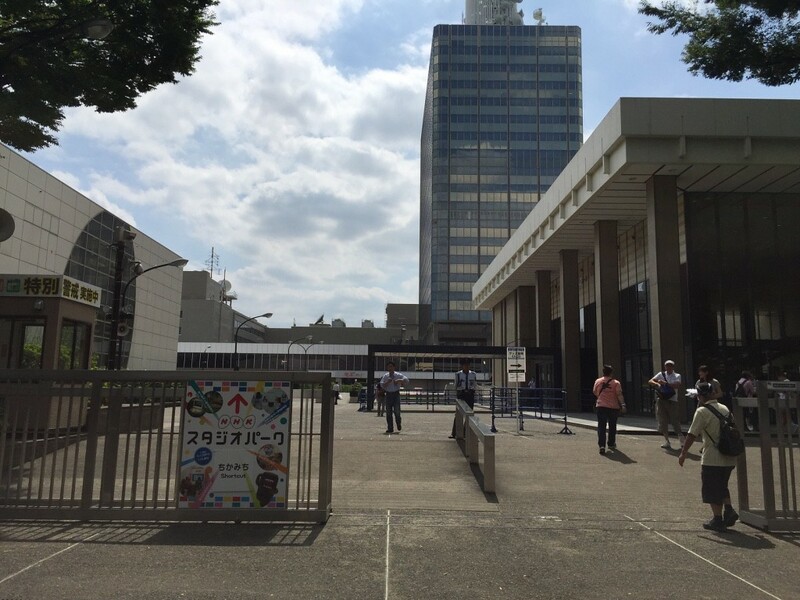 In addition to the National Gymnasium, another prominent attraction flanking the Yoyogi-koen festival grounds is NHK Studio Park, a massive complex of offices, studios, and concert halls that offers tours to the curious for ￥200 a head. If you are scratching your head in obliviousness, maybe this will help: NHK is the Japan Broadcasting Corporation, the publicly funded purveyor of entertainment and educational programming domestically and abroad. Scandals over the last couple decades have all but destroyed the public's trust in NHK's financial management, but one thing cannot be denied: NHK produces some of the best children's programming and educational documentaries in the world. That is my opinion and I'm pretty sure that I am not alone in holding it. Walking through the festival section of the park—Yoyogi National Stadium on your left and NHK on your right—will eventually bring you to an intersection where the other side of the street is obviously the end of the park and the resumption of the metropolis in all its grey-building glory. This is Shibuya, and continuing across the street, around the curve, and right at the T-junction will bring you to Shibuya Station and the famed Hachiko intersection and meeting area. For my own journey, I turned around and headed back into the park. 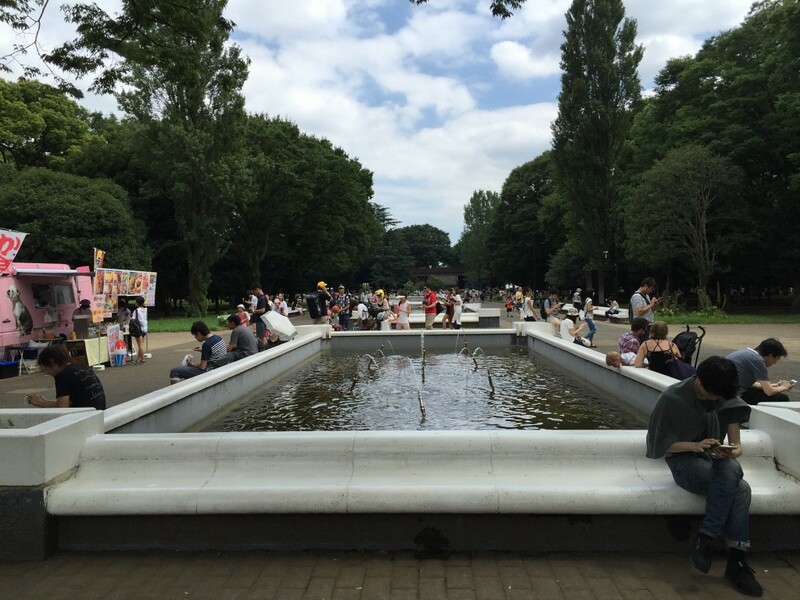 In my youth I would have continued on and wiled away the night in a Shibuya bar, but the late afternoon serenity of the park was more inviting. Besides, late afternoon is when the buskers come out in earnest. 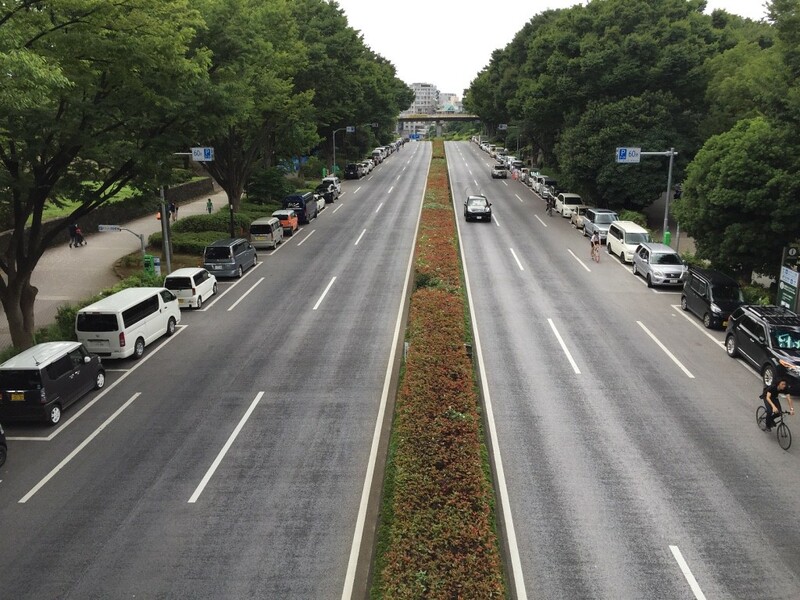 As briefly mentioned earlier, the park side and the festival side of Yoyogi-koen are divided by a road, which is route 413, Inokashira-dori. Followed one direction, this road will take you to Harajuku Station, and in the other direction will take you to Yoyogi-Uehara Station on the Odakyu line, which is a rather long walk and only for the ambulatory perverse. If at this point your day is winding down and you'd like to head back to Harajuku Station, Inokashira-dori is your quickest route back. For me, I fancied another stroll through the park side before wrapping things up. I stopped and watched a few drummers park side on my way back through. Drumming is an unsurprisingly popular activity for the park: loud percussion is nowhere else acceptable in such a crowded city. 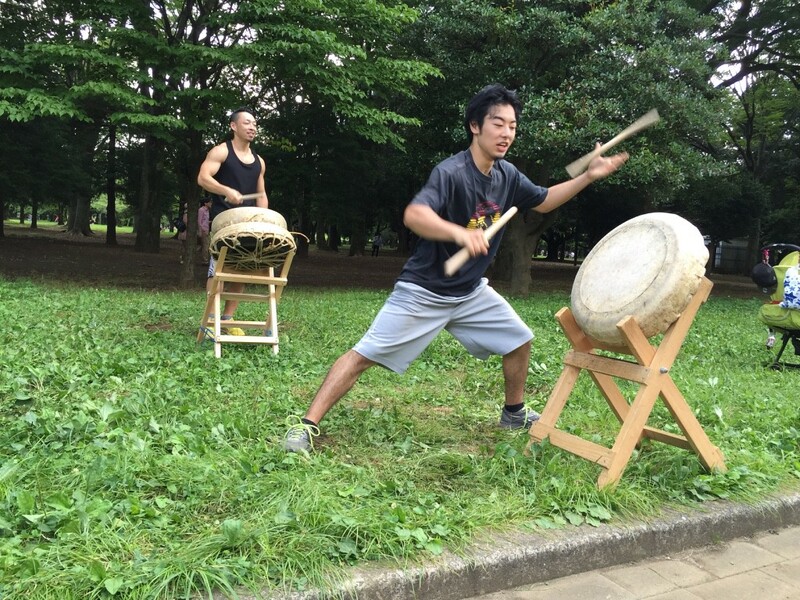 I also saw djembe drummers and traditional japanese taiko drummers, similar to the people in the picture above. Everyone I asked for a photo opportunity smiled and complied, but it goes without saying that asking first is important. 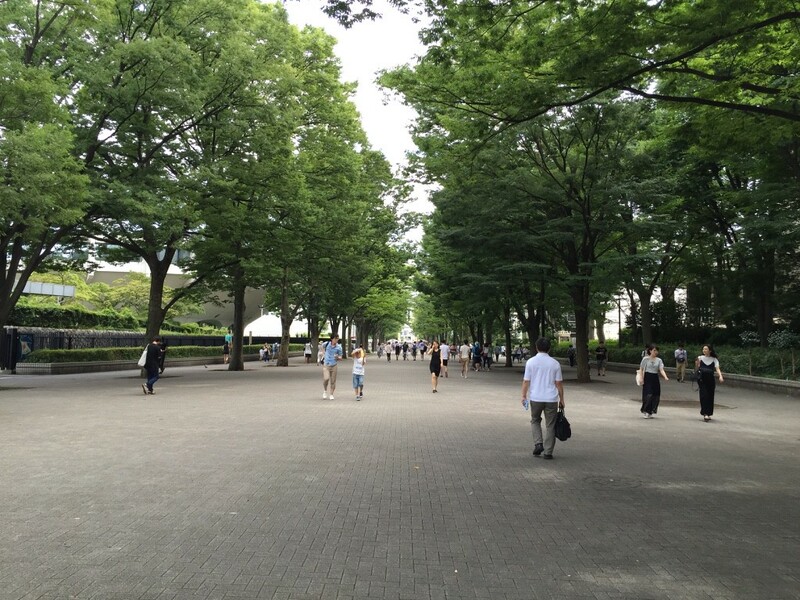 And that was my day at Yoyogi-koen. I have probably spent more time at that park than at any other place in the city. You could go every day for the rest of your life and it would always be a different experience. Needless to say, the place was full of tourists and international expats and no doubt they will all be going back in the future. 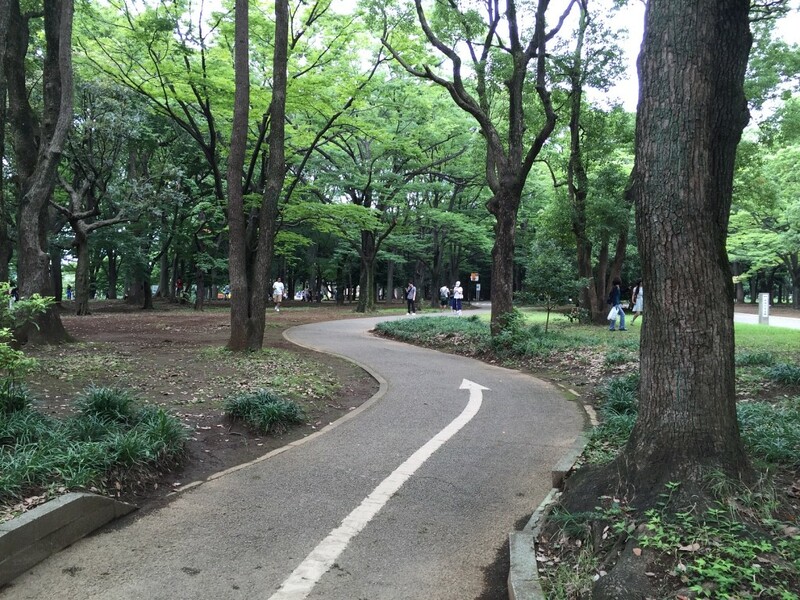 If you want a cosmopolitan Tokyo experience, then Yoyogi-koen is the place to go. And go again. And again. And again. You won't ever be disappointed.